Alvin Adler, M.D. 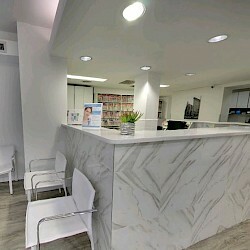 is a board-certified dermatologist practicing at Schweiger Dermatology Group in New York. Dr. Adler has been practicing dermatology for over 25+ years. Dr. Adler earned his medical degree from Albert Einstein College of Medicine in New York and completed his residency in dermatology at New York Presbyterian Hospital Cornell Medical Center in New York City. He is a Clinical Assistant Professor of Dermatology at New York Presbyterian Hospital Cornell Medical Center as well as a Clinical Instructor of Dermatology at Mount Sinai Medical Center. Dr. Adler has conducted numerous clinical research studies and has published articles in peer-reviewed journals. Dr. Adler is a member of the American Academy of Dermatology, the Dermatologic Society of Greater New York, the New York Academy of Medicine and the International Society of Dermatology. I got a same day appointment and great answers to all my questions. Office was very clean. I checked in and was seen even before I had a chance to sit down. So glad I didn’t have to wait in the reception area for an hour like with my old dermatologist.